Test debut: India vs Sri Lanka at Chennai, Dec 2-6, 2005. 27: Most number of matches won by an Indian captain. His winning percentage of 45.00 is the best. 18: Most number of matches lost by an Indian skipper. Dhoni also is the first Indian batsman to complete 10,000 runs or more as captain in international cricket, joining Ricky Ponting (15,440), Graeme Smith (14,878), Stephen Fleming (11,561) and Allan Border (11,062). Dhoni (eight catches, one stumping) became the first Indian wicketkeeper to effect nine dismissals in a Test match in Melbourne, in the third Test, Dec 26-30, 2014. His aggregate of 3,454 (ave.40.63), including five hundreds and 24 fifty-plus, in 60 Tests is an Indian record by a captain, bettering the 3,449 (ave.50.72) in 47 Tests by Mohd. Azharuddin. His best series in terms of run-aggregate is 349 (ave.34.90), including four 50s in five Tests vs England in England in 2014. His career-best is 224 vs Australia at Chennai in 2012-13. Dhoni is the only Indian wicketkeeper to have aggregated over 4,000 runs (4,876) and effected 250-plus dismissals (294 - 256 catches + 38 stumpings) or more. His dismissals' tally is the highest by an Indian wicketkeeper in Tests. 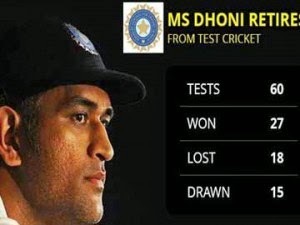 Dhoni is the only Indian wicketkeeper to effect eight or more dismissals in a Test match four times.